Newton County Academy began its formation in the spring of 1969 when it was ruled that Freedom of Choice was no longer acceptable. 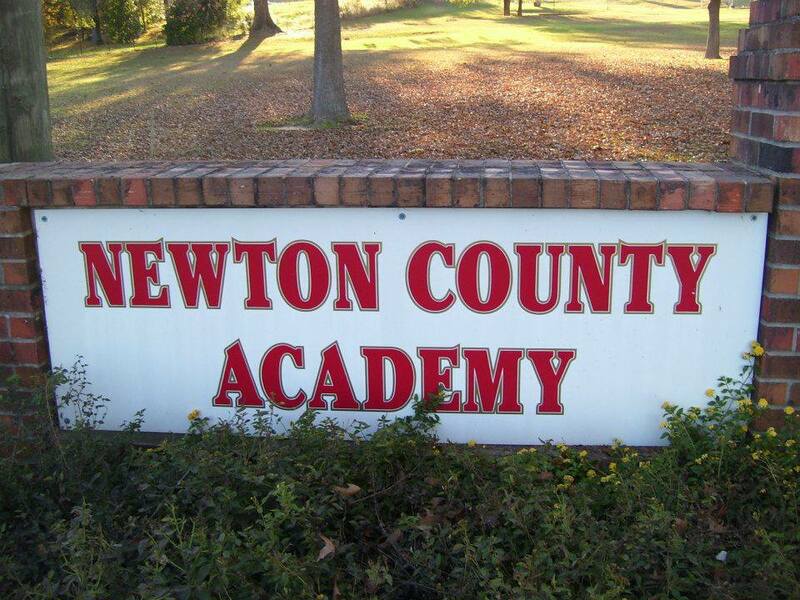 Newton County Academy, Inc. was chartered on January 16, 1970, and began preparations for the 1970-71 school years. The first Board of Directors at NCA were Bill Bailey, Clarence Blount, Albert Carr, Carl Cooper, Gerald Craig, Mason Dennis, Marijo Denson, Marcus Gordon, John Keith Henry, George Monroe, Junior Monroe, George Smith, John Thrash, Dr. James Wakham, and Bennie Walker. The first year of school had 160 families and tuition was set at $65.00 per family plus a $500.00 building fee. The old Gallaspy home located in Decatur was acquired for use and the summer of 1970 was spent painting and repairing and adding to this house to have it ready for students. Five rooms were used as classrooms; the kitchen, a living area, two bedrooms, and the pantry. NCA was ready to open its doors. School began in August of 1970 with an enrollment of 78 students in grades 1-8. The largest class at NCA was the seventh with fourteen and the smallest was the eighth with five. Our first faculty consisted of very dedicated educators. Mr. Mark M. McMullan was Headmaster and taught seventh and eighth grade English and Science. Elementary teachers were: Mrs. Bessie Collier - first and second grades, Mrs. T.B. Johnston - third and fourth grades, Mrs. Felicia Smith - fifth and sixth grades, and Mrs. June Addy - Music education. These individuals were not only educators but were friends as well. Weekly chapel was held and each class benefited from these wonderful instructors. Believing that NCA would only grow, the families of NCA began to look for land to purchase to build a school. Mr. Ted Smith sold 20 acres on Highway 15, south of Decatur, for $6,000.00. Now we had land, we only needed the building. Thirty-four families signed a promissory note which was executed on January 29, 1971, for $60,000.00 and the building process began. Much of the work on the new building was contracted, but many nights and weekends, parents could be found doing anything necessary to complete our new project. From installing plumbing to hanging paneling, any work that NCA families could do, was done. In April of 1971, the east end of NCA was complete and with Mr. "Mac" ringing our hand bell, classes in our new school building began. The 1972-73 school year saw the addition of the football field, 1974-75 the W.R. Lindsley gymnasium and the baseball field, 1993-94 the softball field. Growth continues at NCA. During a difficult financial struggle around the year of 1999, once again, families came together, formed NCA Properties, Inc. and burned the payment note on NCA. This school is now truly ours. In October of 2012, fundraising efforts by the entire school began raising money to install a new roof on our school building. Through these efforts of our patrons this was completed during December of 2013. Summer of 2014, plans & renovations for some much needed work on the baseball field began. Through hard work and dedication of many, many hours & donated supplies our patrons started building a new foundation by moving dirt, planting of new grass in the infield and new backstop. November, 2015 the floor in our gym was sanded down and repainted. The gym floor was named in memory of Coach Tommy Mathews, who was coaching basketball and teaching at NCA when he died suddenly. In January, 2016 lights on the baseball field was added. This has been a dream and vision at NCA for a very long time. We are very proud of these new changes and hopes this trend will continue on toward our other athletic facilities. July, 2016, dirt was moved again. A new All-Sports Weight room and Football Field house broke ground. Through the Bailey Family, who has continued to support and donate to our school academically and athletically our football field was named Bill and Louise Bailey Field. The new field house had many contributors, to which there names are placed on a plaque that will hang in this building as well, but the building will be named Esther's Booth. The football press box also saw some renovations this summer. There are still projects to be done within the field house and these are being done by parents over the next few years. Also, during the summer of 2016 work started happening on our softball field. A new storage area was built to extend one of the dugouts, new fencing and press box was installed. Special thanks to all of these hard-working parents, coaches, booster club and the athletic school fund who are helping with all of these improvements. Spring of 2017, improvements for softball kept coming as dirt started moving once again by blessing this team with a brand new field, dugouts and a really nice area to play on and build this program. January 2018 our baseball and softball programs got a new batting cage dedicated to Mr. Jamie Hollingsworth memory, who played sports at NCA, graduated from NCA and his 3 children were attending NCA at the time of his death. God has truly blessed our school. He has allowed us to reap the benefits of a solid education and we all have many memories that we cherish. Words can never express the gratitude to all of you who saw what an asset this academy would be. To each of you we say a heartfelt, THANK YOU.